Mustard and pork chops. What could be better than that? Not much really. Mustard and pork chops naturally go together – especially the rich distinctive flavor of dijon mustard. There are many variety of dijon mustards available. The most basic is usually a creamy consistency with a pale yellow color. Grey Poupon is pretty much the standard for dijon mustard but any brand to your liking will do. Add in the sweetness of the brown sugar, the tartness and acidity of the apple juice and the savory flavor of Worcestershire sauce and you’ve got a taste explosion waiting to happen. Make sure to save some of the marinade to baste with while the chops are grilling. In a shallow dish combine all ingredients except pork chops and mix well. Set aside a small portion in another container to use during grilling. Place pork chops in marinade and let sit in refrigerator overnight. If you’re in a hurry, let them marinate as long as you can. Preheat your indoor contact grill for at least 5 minutes with the lid closed and high setting if you have it. When grill is hot and ready place chops on grill and close lid. Total cooking time will be 4-6 minutes. 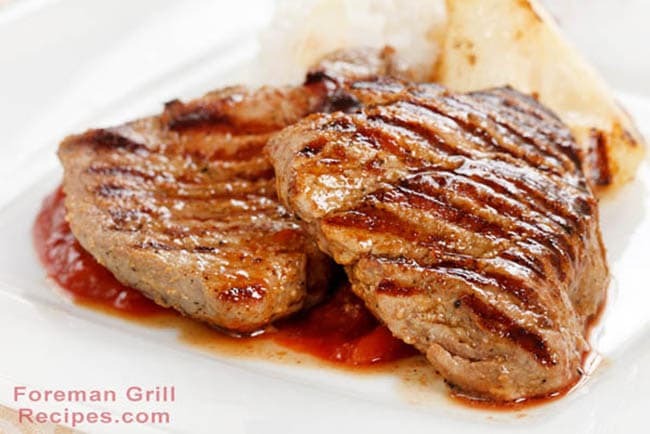 halfway through grilling – give the chops a 1/4 turn and add the remaining marinade to both sides. Serve with grilled pineapple and wild rice for a delicious meal!